A council architect accused of causing an outbreak of Legionnaires' disease in Cumbria has been found not guilty of seven charges of manslaughter. However, Gillian Beckingham, 48, of Grange-over-Sands, was found guilty of one charge of breaching the Health and Safety at Work Act and fined £15,000. Barrow Borough Council had pleaded guilty to breaching the act at an earlier trial and was fined £125,000. The outbreak was traced to Barrow's Forum 28 centre air-conditioning unit. Preston Crown Court heard that in 2002 it sprayed bacteria into the air, causing more than 170 people to contract the disease. At least five were fatally infected. They were: Richard Macauley, 88; Wendy Milburn, 56; Georgina Somerville, 54; Harriet Low, 74; Christine Merewood, 55; Elizabeth Dixon, 80; and June Miles 56. Beckingham was accused of their manslaughter, and also that of June Miles, 56, and Elizabeth Dixon, 80, but at the trial her lawyers argued they had contracted the disease but died of other causes. She told the court her job as senior architect at Barrow Borough Council mainly concerned the design of local housing projects and that she had received no health and safety training. The prosecution alleged that she cancelled a contract which ensured necessary tests were carried out on the air conditioning unit at the arts centre. The court heard Beckingham was on holiday when a second contract to maintain the air conditioning system was agreed. On Monday, after a seven-week retrial, the jury of eight men and four women cleared her of manslaughter. 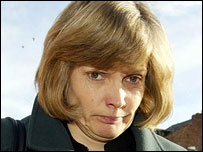 She was later convicted of one charge of breaching health and safety law by a majority of 11 to one. In imposing the fines, the judge Mr Justice Burnton said to Beckingham: "Your failings were repeated and serious which led to multiple deaths and very serious suffering. If you were a lady of wealth, I would impose a greater penalty than I do." With regard to Barrow Borough Council, he said its failings were grave "in the extreme", and if it had been a commercial organisation, with a multi-million pound turnover, he would have had no hesitation in imposing a fine in excess of a million pounds. But he was aware that Barrow is one of the most deprived communities in the country and was also aware that council tax-payers would have to foot the bill. In a statement Barrow Borough Council said: "The council is considering the implications of this verdict with its legal advisers and will issue a statement in due course. "We wish to extend our deepest sympathies and apologies to the families of the bereaved and to everyone who became ill during the outbreak in 2002." Outside court, the solicitor acting for Beckingham, who had been brought back for a fresh trial after a jury at an earlier hearing failed to reach a verdict, read a statement on her behalf. Kathryn Gilbertson said: "This has been an ordeal for Ms Beckingham which is finally at an end. "She has always maintained her innocence to the very serious allegations of manslaughter which have hung over her head, through the course of two trials, and which have placed her and her family under the most enormous strain."